Last week I posted a few comments pointing to a frustrating phenomena I’ve seen with the acceptance (dare I say popularity?) of open source software: we’ve got too many new projects (over a million) in categories already inundated with viable options. 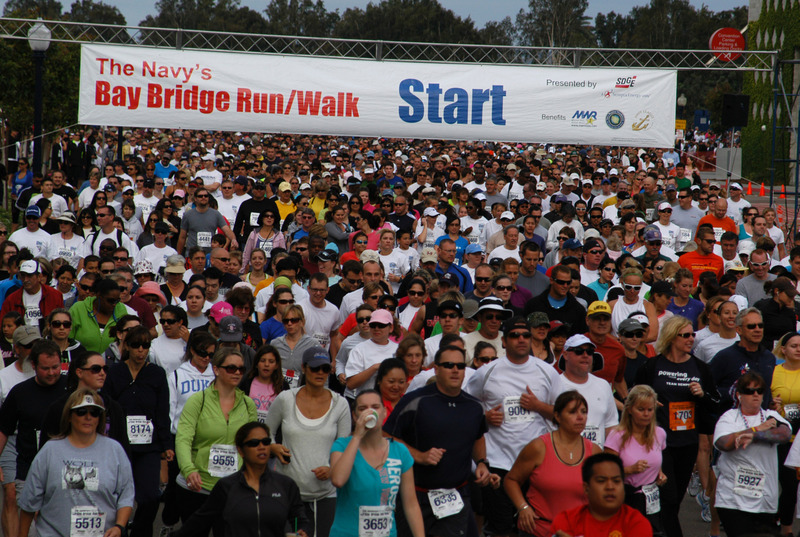 Rather than joining an existing project, folks are creating their own. I used 230+ open source learning management systems (and apparently at least one open source “authoring tool“) to make my point. However, the phenomena is not limited to learning management systems (or authoring tools) or, for that matter, even software, as the problem appears to have crossed over into other sectors capitalizing on “openness” (fauxpenness?) as a development and distribution (promotion?) method. The Open Educational Resources (OER) movement suffers as well from the “starters over joiners phenomena.” Thankfully, there is tremendous interest in both the use of OER broadly and, just as importantly, open source’s foundational practices that enable it–OER is all good and I am way for it. Massive Open Online Courses (OK, I’m not too “for it” with MOOCs–but that’s another post), Creative Commons licensed learning objects, open access journals, open courseware, etc., all harness the collaborative and community processes of co-creation first ascribed to open source software. At the 2010 Educause National Conference, two colleagues, David Staley and Ken Udas, and I presented “The University as an Agile Organization” (see presentation PDF here). Within the session, we supposed how the organization and operation of a college or university might be enabled–and benefit–through the principles behind the Agile Manifesto, especially in light of various trends in technology, teaching and learning, and management emerging within not only education, but institutions of higher education as well. a “university as a networked complex adaptive system is permeable (no formal admissions process); consists of voluntary and self-organizing associations of teachers and students; consists of a self-organizing and intellectually fluid curriculum; does not offer tenure to professors (longevity is determined by the community), who move fluidly between the “real world” and the university; is governed by protocols based on community values and mores rather than on administrative rules and fiats; does not grant diplomas (but does grant certificates); encourages play (and even failure); is governed by “intellectual barter” and makes all knowledge created therein free to anyone; has a fluid temporal structure: there are no “semesters”; teaching and learning are ongoing activities. I think this just may be the best description I have heard, not for MOOCs specifically, but the environment that has created and allowed MOOC’s (and the various MOOC-like organizations that have benefited from their rise, e.g. Coursera, EdX, Udacity), to emerge, not only as a platform, but as an educational development and delivery model. For some time I have been advancing Agile methods, specifically within Higher Education’s Information Technology offices. 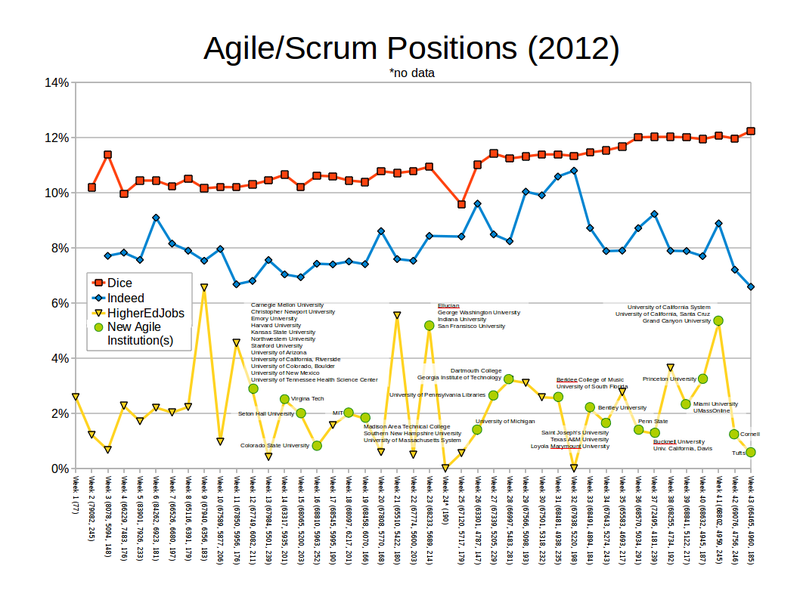 Beginning in 2012 I began weekly queries of Higher Ed Jobs (www.higheredjobs.com) to identify IT specific jobs which include “Agile” or “Scrum” within their job descriptions. These are then compared to all IT specific jobs posted to the job search site. In order to provide a more comprehensive understanding of the IT industry’s adoption of Agile methods, I added Dice (www.dice.com) in the second week and Indeed (www.indeed.com) in the third. With the fiscal crisis facing campuses, many operational systems and services that previously may not have normally undergone much scrutiny during the budgeting process, are now being re-assessed: do these services still provide the value they once did or are they still required–and if not–can they be eliminated? Some of these discussions have become popular throughout higher education, resulting in ideas such as: eliminating or reducing land-line phone service in the residence halls as students with cellular phones increase; moving email off campus to third-party services like Google or Live@edu, or; closing academic computer labs in recognition of the growing number of student-owned laptop computers. It is interesting to consider how the services offered in these three examples have shifted over the years from innovative to key-differentiator to industry-standard to indifference to wasteful. What’s the prevailing business management strategy of the day (i.e. governance, decision-making, planning, change management, leadership, visioning, etc. ), not just for Higher Education or IT? You are currently browsing the IT Governence & Planning category at TwoThree98.